To a demonstration of high-end home audio from Linn. This is apparently how the new hi-fi dream works. You buy a pair of tall speakers which can be shrouded in appealingly-designed covers to make them look more like furniture than audio equipment and an inscrutable-looking box which houses the streaming unit from which all the music is chosen via an iPad. The idea is you have all the music in the world available via a service like Tidal, you choose what you want and the bidden sound magically manifests itself in the air. The system sounds great. It's undoubtedly the future, or at least one of the futures, but it's a hereafter which will have to get along without me. For me music has always been indivisible from stuff. That's not simply because music was the sole channel for my male instinct for acquisition. It's because the whole process of falling in love with music was inextricably bound up with holding it in my hands and this wasn't just for the obvious reasons. This deep bond between a thing which is intangible and the vessel that traditionally carried it goes beyond simply being able to read the sleeve notes. With a physical product it was clear that you owned it because it sat on your shelf. The physical product sealed and deepened your relationship with the music and the people who made it. With each revolution of the label you absorbed all sorts of ideas about the culture which had produced it. It wasn't all romance. It was marketing and branding as well. The cover of a twelve-inch long-playing record always managed to persuade you that the music within was rarer and more precious than it actually was. That same music, which was immediately less valuable once on the less charismatic carrier CD, can now be summoned by the stab of a finger on the screen of a tablet and consequently seems to have no value at all. 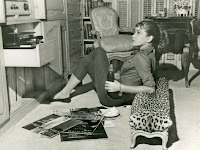 You can find hundreds of pictures of starlets of the fifties and sixties apparently "relaxing" at home listening to a bunch of gramophone records, strewn across the floor around their recumbent bodies beautiful. That was the dream of good living in those days. Stuff as far as the eye could see. Today's good life is measured in access to experiences rather than stuff. I understand that. 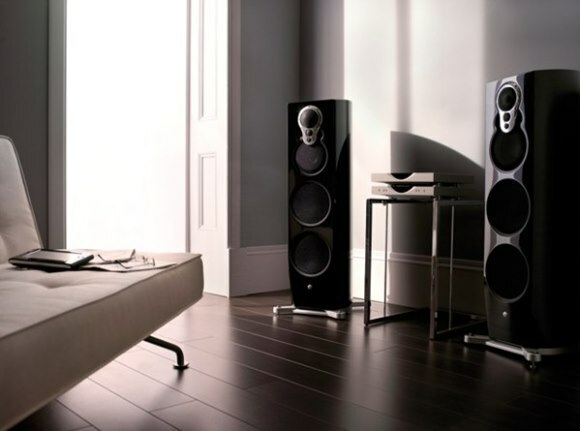 If you were to invest in a Linn system, or something comparable, the amount that it would cost you would say a great deal about the value you attach to the experience of good sound. The problem is that if you attach the same value to your idea of good music (and everybody thinks they know what good music is) you are also going to want to be able to see and touch the physical manifestations of that music. The future as envisaged by companies like this is a future lacking the very thing that got me at least as excited as I was excited by the music itself - the records it came on. I went with my friend Brent Hansen, who does have an expensive hi-fi. What Brent does these days is buy the records he wants on expensive vinyl. He then uses the enclosed code to download a digital version to play on his phone. It wouldn't do for everyone. Then again, the future of recorded music is a multi-lane highway. Not everyone will travel the same way. "Today's good life is measured in access to experiences rather than stuff." True. But owning the Stuff and handling it is itself an experience; one that bafflingly seems to elude today's good lifers. "The problem is that if you attach the same value to your idea of good music (and everybody thinks they know what good music is) you are also going to want to be able to see and touch the physical manifestations of that music." And, of course, to display them, and so declare your tastes. Surely we can all remember visiting new acquaintances, and flicking through their record collection to get a picture of their personality? How do you do that any more? And that wonderful principle of osmosis, by which simply carrying an LP around somehow transferred its cool to you. Gone forever. It's worth wondering, on that principle of everybody thinking they know what good music is, whether people would still be happy to display the music they are listening to? Suppose there was a little read-out, worn as a lapel badge, which streamed the titles you were listening to – would people do that? record shops the physical object,but the reality is it's fine when you have a handful of singles, when you own maybe 40/50 lps but when they grow to a 4 figure number and then the same thing happens with your cds, there comes a reality where unless you have a house of many rooms, there just isn't enough room to live..and don't ever start buying super deluxe box sets. My practical solution has been to rip all the cds to a hard drive (in FLAC so they're identical in quality to the cd itself), box them away along with the majority of my vinyl collection, but keeping a couple of hundred lps and singles still to play. I've a Sonos system connected to my (decent) stereo and additional speakers in the kitchen and bathroom. It's way easier to play stuff and I reckon you listen to more..although it's easy to forget what you have! The road I haven't taken is the streaming Spotify/Tidal route. To be honest at nearly 60 yrs of age, I've limited room in my head for new stuff. Both is possible, I also have an expensive stereo, Linn as it happens including their LP12 turntable, and play both LPs and ripped CDs or downloads from a server. I prefer the vinyl but streaming is no different from when we bought an album and immediately copied it onto a TDK SA90 either for your mates or for the car cassette player. Streaming is just a posher version. Whenever I get the chance I'll sit and play my records but sometimes, after a few, it's nice to sit back and work my way through Van Morrison's back catalogue without leaving the comfort of my seat. I agree records are the most tactile objects going. They carry everything, sound, pictures, information and memories so they sit proudly in my sitting room for all to see as well on my turntable. They're so room for both as record companies are now belatedly finding out and with vinyl now available again on the High Street it will be like the 70s revisited. I've always been a bit of a hi fi snob. And got a bit cranky recently with my local hi fi expert when the new Japanese amp I bought just didn't sound right. Cue lots of discussion about woofers and tweeters, but no resolution. Hello David, I'm the same, but I also listen to a lot of digital music via iTunes, iPhone and laptop. The newer stuff I really like I then buy on CD. Vinyl is just too difficult to justify nowadays in terms of space. My stereo's 25 years old and was a deal from Richer Sounds, but I did spend £300 on headphones. So I'm a real mixed bag I guess. All of which is probably not very interesting, but I thought you might like to see this rather daft project of mine that I spent a few hours every week for a number of years doing - it's a website devoted to record design, not just the front, but the spines, etc. All photographed by me. It's at http://www.hardformat.org. I ran out of steam and stopped updating it a year or two ago, but still sometimes wonder whether I'll return to it when life's a bit less hectic.